Kip and the Magical Belt book is available as a SET with Bubba the Jiu-Jitsu Bear for a child to train with. Kip and the Magical Belt is the heartwarming journey of a young boy having difficulty at school. Lacking courage and the tools he needs to defend himself, he gets targeted by the school bully. Kip finds the help he needs in the most unexpected family heirloom, and with hard work and discipline, he builds his physical skills and confidence. Kip and the Magical Belt will leave you wondering if the magic is really in the belt or in yourself. The book includes a detailed page that supports parents in pursuit of anti-bullying information. This information and the story, together, help children and parents learn techniques and life changing principles that can improve how your family understands and prevents unwanted situations. Bubba is a one of a kind bear that is 31" tall and created with fully moldable jointed skeleton that allows you to place into poses, practice jiu-jitsu, and even cuddle with. Start your child's journey in jiu-jitsu with this touching story and a posable grapple bear to bond with. This set includes a high quality hardcover printed book and a 31" plush posable bear. Collection: Jiu-Jitsu Bear & Book has been added successfully to your wishlist. This exciting collection includes Kip and the Magical Belt to inspire them to learn and Bubba the Jiu-Jitsu Bear to help them on their way. Kip and the Magical Belt is the heartwarming journey of a young boy having difficulty at school. Lacking courage and the tools he needs to defend himself, he gets targeted by the school bully. Kip finds the help he needs in the most unexpected family heirloom, and with hard work and discipline, he builds his physical skills and confidence. 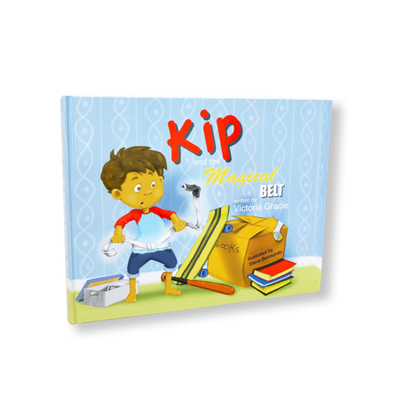 Kip and the Magical Belt will leave you wondering if the magic is really in the belt or in yourself. The book includes a detailed page that supports parents in pursuit of anti-bullying information. This information and the story, together, help children and parents learn techniques and life changing principles that can improve how your family understands and prevents unwanted situations. Bubba is a one of a kind bear that is 31" tall and created with fully moldable jointed skeleton that allows you to place into poses, practice jiu-jitsu, and even cuddle with. Start your child's journey in jiu-jitsu with this touching story and a posable grapple bear to bond with. This set includes a high quality hardcover printed book and a 31" plush posable bear.